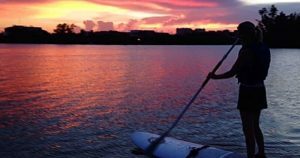 Take a Sunset Kayak Tour at Sebastian Inlet State Park for a memorable exploration the Indian River Lagoon, home to brown and white pelicans, herons, egrets, osprey, bottle-nosed dolphin and manatee. Or maybe you’d prefer the Full Moon Kayak Tours, available on June 29, June 30,July 27, 28 and Aug 25. 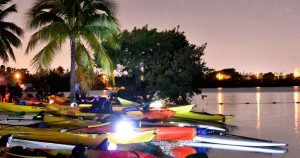 Under the light of the full moon, join an adventure, glow sticks in hand, through the grass flats and explore the Indian River Lagoon. After the tour, relax and enjoy Smore’s and refreshments at the Marina. Included in these tours: a kayak or paddle-board, safety vests and safety instructions. What to bring: bathing suit, sunscreen, towels, sun protective clothing (ie. hats and sun shirts), water shoes or waterproof sandals and bug spray. This entry was posted on Monday, May 28th, 2018 at 9:28 am	and is filed under Drive I-95, Entertainment, Family Fun, Florida, Nature, Special Event, Sports, United States, USA. You can follow any responses to this entry through the RSS 2.0 feed. Both comments and pings are currently closed. 30 mySQL queries executed in 0.244 seconds.